Landing on Kota Kinabalu International Airport at exactly 3.20pm, I was feeling very upbeat about my first solo travel. 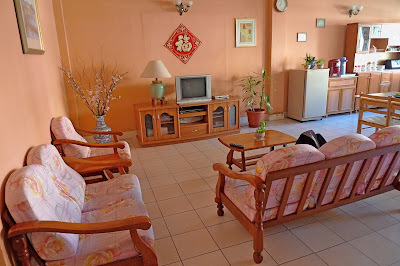 From the airport, I took a taxi to the place where I was going to stay for the next 3 nights - Lavender Lodge at Jalan Laiman Diki in Kampong Air. It took about 20 minutes to reach the hotel. I paid RM20, which was the standard fare, to the taxi driver. I should not have taken the taxi in the first place. I will tell you why in a minute. See the "The Lavender Lodge" signboard? If you think I would be staying in some high class 5 star hotel, then you must have missed my previous post where I said that I would be backpacking this time around. How did I know about this place? 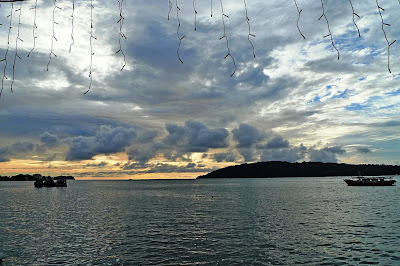 Well, it was where blogger QuaChee stayed the last time he went Kota Kinabalu (KK). He recommended it, so I guess why not give it a try! 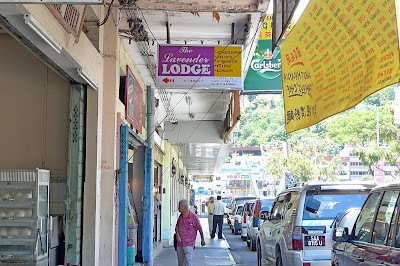 Lavender Lodge is situated on the first floor of the shoplot. It is basically a bed and breakfast hotel, specially for backpackers. I was given a warm welcome by the Filipino staff there. She was surprised I arrived there by taxi. Didn't the boss meet you at the airport? she asked. I was like, what?! The boss was supposed to fetch me at the airport? She quickly made a call to her boss and told him I have already arrived. It seemed he had been waiting at the airport for me! Now before you think I am some big shot who needs to be chauffeured driven, here's exactly what happened. When I booked this hotel 2 weeks before my trip, I learnt that they provide free transport from the airport if I stay for more than 2 nights. So I requested for it. At that time I was talking to the boss' wife. But 2 days before my trip, I called the hotel to re-confirm and the person in charge at that time told me I had to email the boss and make the request, otherwise I would not get the free ride. Well, I thought it was too much of a hassle, and decided to just take a taxi instead. This is how the hotel lobby looks like. More like a sitting room in an average house, right? This is one of the two tables where we ate our breakfasts. What did we have for breakfast? Well, they provided us with just bread with margarine and kaya, and either tea or coffee. Basic stuffs. Oh, and some bananas too. I guess bananas were the cheapest fruit they could find. Haha! When I told my female friend back in KL that I ate bananas for breakfast in KK, she could not stop laughing. Aiya, so narrow minded one, my friend. My room was on the 3rd floor. When I entered, I thought, how very small! And there was no window at all! There was just a double bed, a small table and a cupboard inside the room. But I was not complaining. At only RM65 a night, I was satisfied. At least it was very clean. That's the most important thing! 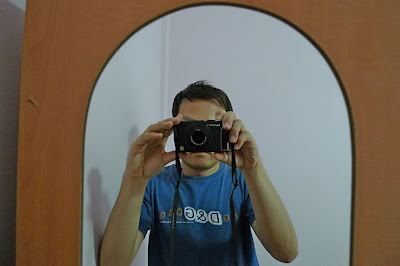 I took a fancy to the mirror in front of the cupboard and took a snapshot of myself taking a snapshot! Haha! Oh, did I mention there was no attached bathroom? They only have common toilets and bathrooms. To be precise, two toilets and two bathrooms on every floor. At first, I thought it would be a hassle, but I got used to it very quickly. Besides, after some time, I thought it was a very good idea. It was the perfect way to bump into other backpackers staying in the hotel. There was one time I was washing my hands in the bathroom, when someone walked past and said hi. I looked up and was stunned to see a pretty young Caucasian lady who looked like Nicole Kidman, wrapped only in a bath towel! She was walking to the bathroom next door. I quickly recovered, smiled and said hi to her. Wow! Now you see why I don't mind not having attached bathroom? By the way, the toilets and bathrooms were very clean! I was impressed. Having checked into the hotel, I went out to explore KK town. 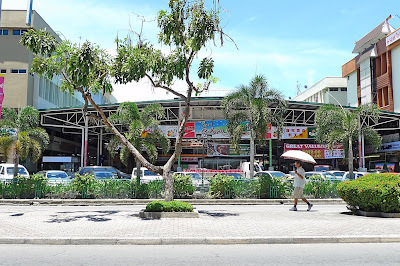 This is the food court opposite Lavender Lodge where you can find cheap seafood. Next to the Food Court is the SEDCO complex which houses shoplots and other backpacker lodgings. 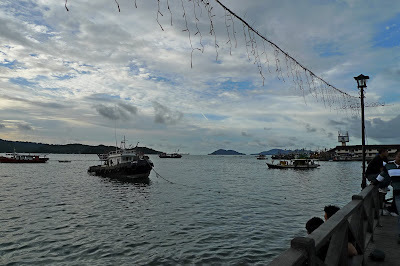 After walking around town for some time, I reached the KK Waterfront which faces the sea. I realised it was almost sunset and decided to stop by there to take some pictures. Well, it was not really sunset time yet, so I decided to walk across to the evening market area, opposite Le Meridien Hotel. There were a lot of people and I did not take any photos here. But I could see the sea food that was on sale. They were huge! The fishes were big! And I have never seen squid that looked so big. At least I have never seen sizes like that in KL! After walking in the crowded market for some time without buying anything, I walked back out again and realised the sun was setting. Quickly I snapped a few more pictures. There were a lot of people here snapping photos like me and enjoying the sunset view. As my stomach started to growl, I decided to have dinner at one of the restaurants at the Waterfront. After dinner, I headed over to the shopping malls to get myself a raincoat. Why raincoat? Because I would be going to Kinabalu Park the next day and I was advised to get a raincoat in case it rains! YAY!!!! See? It pays to be a night owl ha ha!! Wow Foong, some of the pics are really beautiful! U know, I've never been to KK! For backpackers, the hotel sounds perfect but for me, for sure I'd want an attached bath! I LOL reading abt ur encounter with Nicole Kidman hehe! I wanna go to KK too!! and hiding half of your face behind the camera is still not enough to convince me that u r a guy! nice try! hmmph!! 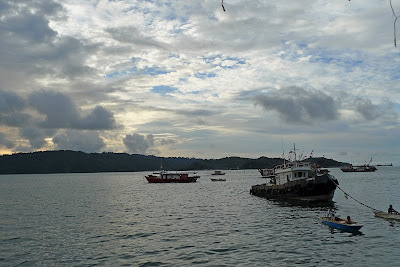 i never been to KK which my younger sis already been there on office trip. my company won't take me there for sure. they are just so stingy to spend every single cent but its ok to take other people's money? LOL. the room is very clean. i won't mind but i do hope that the toilet is in the room. i use toilet a lot. do you put cream and lotion in the toilet too? ah hate it when people are looking at me with my stuff LOL. but i know this is the best way to save your money and travel at the same time. if you and quachee can do it... why not me right? as long as it is clean. Lavendar Lodge looks quite nice actually! Kewl. mariuca, haha! It does pay to be a night owl sometimes! Congrats for being FC here. I think most ladies would prefer an attached bathroom. Most of my female friends will attest to that! This is the first time I stay in a hotel with non attached bathroom and although initially I did not like it, I got used to it after that and it was fine with me. The lady I bumped into really looked like Nicole Kidman - no joke! Maybe it's her sister. Haha! But unlikely she'll stay in a budget hotel unless she wanted to experience the backpacker way of traveling! LOL! cashmere, thanks. I love the sunset at the Waterfront. Now you believe I'm a guy? Haha! nic, I thought you said you miss me. But you just miss KK town. Cheh! Haha - just kidding! Btw, why are you no longer blogging? I'm waiting for you to blog publicly again! faisal, your company so stingy one ah? Never mind lah, you go travel on your own. I don't bring along lotion and cream on my travels, but you can bring them to the bathroom but cannot put your things there as it's a common bathroom and you don't want to see your stuffs missing, do you? savante, yes it's quite a nice place. It's clean and neat and the people there are friendly and helpful too! 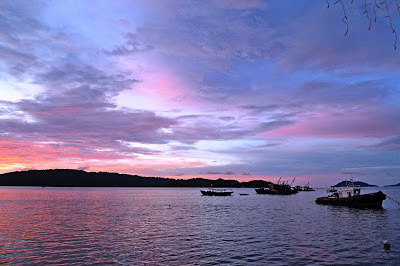 And it's located at the perfect spot in KK - just 5 mins walk to the nearest shopping mall, 10 mins walk to Waterfront to see the beautiful sunset and 15 mins walk to Jesselton Point to take a boat ride to the islands near KK. 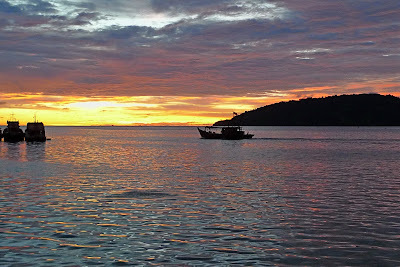 I have no qualms recommending this place to anyone who is looking for a fuss free stay in KK! JL, thanks and welcome! I'm still not open about my identity - look, I took the photo of myself but my face is hidden behind the camera. Haha! In fact, I think it's better that I stay that way - more mysterious! LOL! not that i can't travel solo, but i'd like to have a good conversation and sharing my joy with someone too. faisal, I have awards too? Thanks! I missed the clouds on Mount KK! The motel had a very homely feel. At least it doesn't look sleazy with dubious characters! JL, haha! i knew it. Glorious weather you had, Foong, and what a sunset! Nice pictures, all of them. And the hotel looks great. Yeah, cleanliness is a priority though too bad about the miscomm on the airport transfer. Oh well, you lose some you win some, right? Life goes on.. It's good the hotel is in such a strategic location. How long were you there again? Bring on part two. We are ready for it. You know, if you could also provide details of the hotels, your posts would make a great resource for future travellers. Quachee did a great job of that. Just my two cents. Yeah, exactly that, optional on my last point. happysurfer, thanks! I was there for 4 days. Haha! This is definitely no April Fool. You will have to wait till next year April 1st for my next April fool! I was actually thinking of providing details of the hotel but then I thought against it. Why? Cos I'm not paid to advertise for them! Haha! Just kidding there! Seriously, I provided the link to the hotel's website so all info are at the website. Too lazy to type out the address and details when you can just get all of them at the click of your mouse! LOL! I love KK...but it's quite expensive. For RM65 here, you can stay in a pretty good hotel with bathroom attached. Any plans to come to Sibu? Try getting the zero airfare or cheap offers on the cheap airline. Can always stay at my place - tidor, makan...all free! But share bathroom and toilet lah! Hahahahaha!!! Lavender Lodge looks like a decent place to stay....but I don't like that they don't have attached bathrooms though. Hurry up with your next post. Cannot tahan oredi! wow, how can that 'nicole kidman' doesnt mind using a separate bath? she shud taken some better place with better privacy from eyes like foongpc!!! but the place looks clean though, not like what i wud think those kind of place wud actually look like..
i like bananas n bread for breakfast! it's a great substitute to sausages.. hahahaha..
well, the room and the lodge look very clean!! Foong, you are right. I missed that. Oops! Thanks. last time i went to the marine park... did u go there? i just came back from my redang trip too.. haha.. Some more Nicole's "sister" said hello to u eh? LOL! borneo falcon, why doesn't it suit you anymore? Where is Capitol Hotel? mei teng, I think most ladies won't like the common bathrooms and toilets! But this one is a good experience for me! I guess there are many other backpackers lodges in KK with attached bathrooms. lina, yeah most ladies will want attached bathrooms. So this place won't score with the ladies! haha! merryn, I think Western ladies are not so concerned with attached bathrooms. Haha! anton, actually I do eat bananas for breakfast back home! So it's not too unusual for me to eat bananas there! Now I'm talking about the fruit just in case you are as narrow minded as my friend! Haha! nic, I'm a man, not a girl OK? You sure you miss me and follow my blog religiously or not? OK, to prove it, I expect to see your comments on every post on my blog from now on! haha! Yalah, if only it's Nicole Kidman herself and not her sis! LOL! what a perfect getaway, foong! great captures. i know what u mean, if i were there, I also can't resist the beautiful sunset. all i can see is your face mainly hidden; only showing glimpses. sigh! wow...love those pics.. now I missed my hometown! It's too bad you missed out the transfer to your lodge and wasted RM20! But it's ok, as long as you enjoyed the stay and holiday. :) The pictures of sunset are really beautiful! Wow so lucky to have met "nicole kidman" at a place like that! 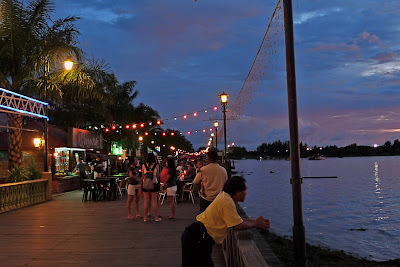 Did you go to any of the bars at the waterfront? Wow! You can get free ride? Not bad at all ler! The living room is quite ok ler! Very cosy and makes me feel at home! 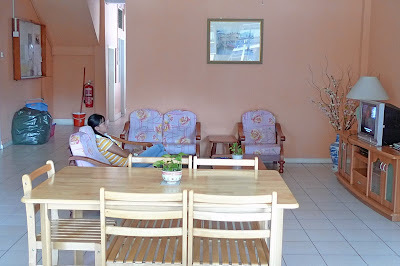 The sitting room, with a TV set, is the place to meet other travelers. I also like to backpack, but it is kinda weird to do so in my own country. RM20 is not a lot, i think you have already forgotten about that after you saw "Nicole Kidman" right?? hehehe..
what's the problem with having bananas for breakfast?? i'm very curious why your friend kept laughing at that?? the waterfront was a great place to hangout i supposed, hope it's as beautiful as what has been portrayed in your photos..
Love the purplish sunset view. See you in here for the first time, Foong! I thought you want to keep your identity? BTW, staying in lodge or hostel or guesthouse is fun and cost saving too. If you do research before booking, you certainly will not bump into a dirty one! Oh how exciting! i feel like I am on this adventure with you! I love all the pictures and finally I see you (okay well part of you). Looking forward to more adventures! The backpackers' hotel looked clean and good enough for me. p/s: cnt wait to see ur next post! Those places still looks the same. 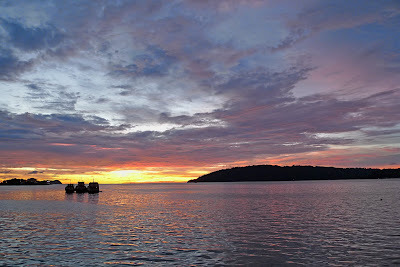 I went to KK few years back. Nice view from the waterfront. life ramblings, thanks! Yeah, the sunset was beautiful indeed! I still prefer not to reveal my face, so if you want to see me, you have to meet up with me. Haha! tekkaus, yeah, the place is not bad at all. And yes, get free transport from airport too. khengsiong, it's not really that weird. What's wrong with backpacking in your own country? SK, actually RM20 not really a lot, but if can get free ride why waste it, right? The Waterfront is more beautiful than what my camera could capture. Furthermore, I'm just an amateur at photography so someone with better skills would most probably capture nicer looking photos! che-cheh, actually the lodge I stayed in also have rooms with windows. Just that those were fully booked. jam, well, just reveal a bit only it's fine. Not revealing my face so it's OK. Haha! amei79, yes the location is pretty good. 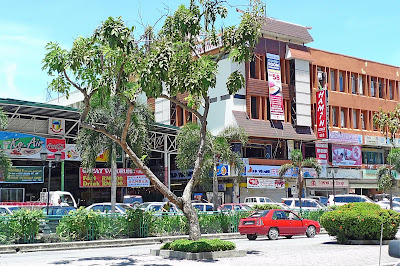 Just 5 mins walk to Centrepoint Mall, 10 mins walk to Waterfront and Central Market, 15-20 mins walk to Jesselton Point if you plan to go island hopping. And there are banks within 5 mins walking distance behind the lodge. Also just 10-15 mins walk to the popular and busy Gaya Street. eastcoastlife, so you are planning to go KK for a holiday? Lucky guy, seems like you were stunned by the "nicole kidman" look a like! Nice photos of the sunset, love it! ehehe, Filipinos are everywhere! The hotel you stayed over looks pretty clean. You snapped a shot of yourself but you purposely covered it! You also thought I'm a girl? Well, what else is new? LOL! hey you're using a Lumix LX3 as well?!!! that's cool. J2Kfm, yes using it but not very sure how to use all of its functions. So still sticking to auto mode. Haha! heya, it could just be the same room haha! some actually have windows - but think they reserve it for their regular guests.